Mighty Final Fight Nintendo NES Board Pics Authentic! 9 product ratings - Mighty Final Fight Nintendo NES Board Pics Authentic! Mighty Final Fight Nintendo Entertainment System NES Game Cartridge Nice! Mighty Final Fight Nintendo NES Capcom Video Game Cartridge lot CLEAN & TESTED!! 9 product ratings - Mighty Final Fight Nintendo NES Capcom Video Game Cartridge lot CLEAN & TESTED!! 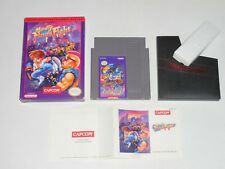 Mighty Final Fight Box Only NES Nintendo Replacement Art Case/Box!!! Mighty Final Fight, game 8 bit, NES for Famicom, Dendy, Fast delivery of air! Mighty Final Fight Nintendo NES Capcom Cartridge lot Game Box Inserts TESTED!!!! 9 product ratings - Mighty Final Fight Nintendo NES Capcom Cartridge lot Game Box Inserts TESTED!!!! Mighty Final Fight Nintendo NES Complete CIB Box Manual Registration Card Lot!!! 9 product ratings - Mighty Final Fight Nintendo NES Complete CIB Box Manual Registration Card Lot!! !